Reading Skills 3A offers a collection of twelve nonfiction stories at a third grade reading level with three supplemental activities for each. 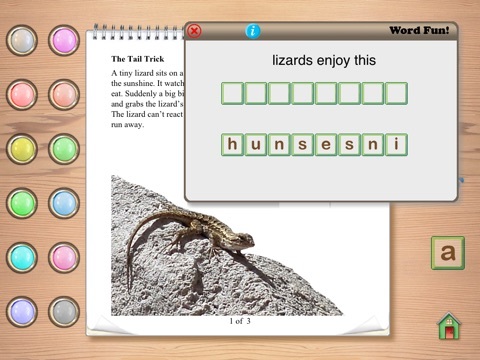 Activities include a scrambled word game, true/false questions and multiple choice questions. The application keeps records of one user’s performance. 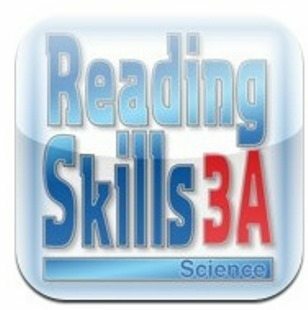 With 12 non-fiction stories, Reading Skills 3A (Science) makes reading comprehension interesting and interactive. This application from Ventura Educational Systems is an outstanding program for readers at the third grade level. The home screen is clear and easy to use, with only four icons at the bottom to operate the system. The standard gear icon accesses the settings, where sounds can be turned on and off. The information icon opens a user’s guide that parents will find helpful. It tells how to access each feature of the system. The scorecard allows access to current records of the user’s performance, and can be cleared when desired. The arrow accesses the reading passages, which are chosen by touching a colored dot at the top of the next screen. Touching the dots produces a musical note and takes the user to a reading passage. Reading Skills 3A accomplishes its goal of providing reading comprehension practice for students at this level. The nonfiction science passages are interesting and engaging. They will be useful not only for third grade students, but also as high-interest/low-vocabulary activities for older students with limited reading ability. The readability of random passages was assessed using the Spache Readability Formula, and all passages checked were indeed at the third grade reading level. 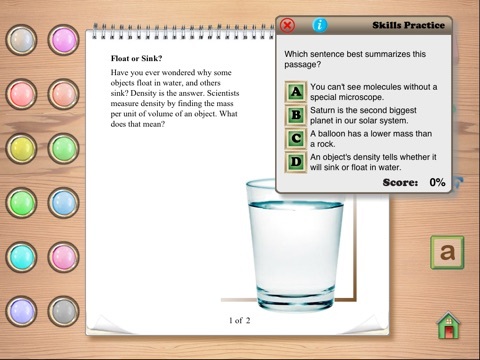 The questions cover a range of cognitive levels, and also assess student attention to the informational graphics included with each passage. The application keeps records for one user in the form of percentages of correct responses for each activity of each story. The application could be improved in a few ways. 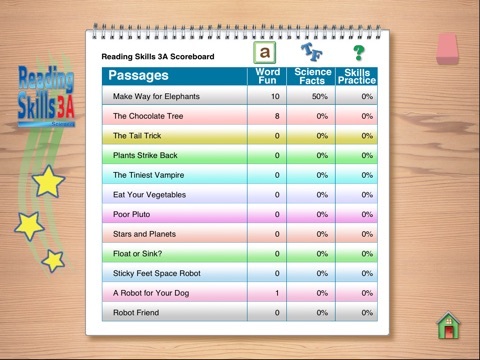 The activities post a running percentage of correct responses as students complete each item. It might be very discouraging for a student who misses the first problem or two, since their “score” will be low from that point onward. It might also be helpful to have an option for students to look back at the pages of the text to find answers they do not recall. The interface to choose passages would be better if the reader could see the titles of the passages in order to select the desired one. The musical notes feature, while entertaining for a few moments, does not add much to the overall educational value. Some children may get distracted from the reading task by playing melodies on the buttons or trying to sound several in an overlapping manner to make various harmonies and discords. The record keeping system is very nice, but limited if you were to use this application with a group of students or with children in the same family. It would be nice to be able to set up for a small group of users and keep their records separately. 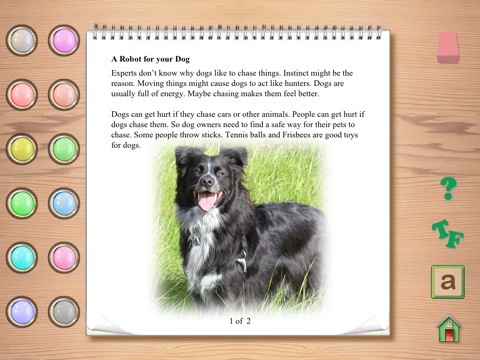 This application’s stories will be highly motivating for young readers. The topics, which include passages about chocolate, robots, outer space, and carnivorous plants, are engaging to an array of users of different ages and abilities. The information is novel, and not likely to be within most children’s common knowledge set. Passages are illustrated with appropriate, colorful pictures as well as informative graphics such as charts, graphs and maps. Reading Skills 3A is a good value for the money. It costs $2.99, which is less expensive than many other types of educational activities. Students are likely to enjoy reading the passages multiple times, and those in family or classroom settings will be able to get lots of use from it as different children take turns using the program. I wish there were more stories included, however. This application is very child-friendly. It contains no links to the internet or social media sites, so adults need not worry that children will gain unauthorized access. There are no in-app purchases available. The directions for usage in the Information Section are appropriate for a child to read.